California Tiger Salamanders are a major species of salamander with an exceedingly interesting lifestyle. Read on to know more about these fascinating creatures. 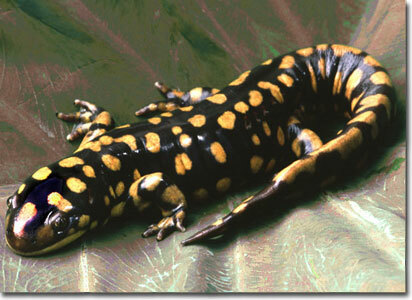 California Tiger Salamanders are from the family of Mole Salamanders. They basically live in the Northern California. They are named after the place of their habitation. They have a stocky appearance with a small head and a broad and rounded snout. The members of this species are larger in size than other Salamanders. The adults can grow 6-7 inches long. The male members of this species are larger than the female ones. The adults are of a glossy black color with large bright yellow spots and stripes. Sometimes, these spots are not there along the back. The species earned their name from these spots. Some members of these species may have a cream colored band on the lower side of their body. The skin of these creatures is shiny moist and without scales. The adults of these species have protruding brown eyes with black irises. The tails of these creatures are long and flat from the sides to help them swim. It is easier to distinguish the male salamanders from the female ones during breeding seasons by their swollen cloacae. The transformed adults of this species have lungs. The larvae of the California Tiger Salamander are fully aquatic and are of a greenish grey color. They have broad caudal fins, a broad, flat head and 3 pairs of bushy external gills. During the breeding seasons they move to ponds or lakes. This species breeds in water. The breeding season usually starts in December and continues through February. The breeding age for these creatures is 4-5 years. The breeding season begins in the early winter, when the ground is sufficiently moist due to rain and temporary ponds begin to form. At the start of the breeding season the California Tiger Salamanders migrate to water. They do so only during the night (nocturnal breeding migration). The males reach the breeding spot before the females. According to a study, the male salamanders stay at the breeding pond longer (37- 44.7 days) than the females (10- 11.8 days). Fish-free temporary ponds that dry out during the summer months are usually chosen for breeding. The females lay the eggs and attach them to the underwater stems, leaves etc. The California Tiger Salamander eggs are of a brown or pale yellow color. They are approximately 2 mm in diameter. The eggs take 2- 4 weeks to hatch. The larvae take 4-5 months to grow fully. Their metamorphosis occurs during the summer months. These creatures are not good burrowers themselves. So, they take shelter in the abandoned burrows of other small creatures like ground squirrels. They only come out of the burrows during the breeding season. The adults can move at an average speed of 50.8 m/h. The young ones run much slower, an average of 30.9 m/h. These creatures do not breed in years with little or no rainfall. The creature is used to feeding every 2- 3 days. The small larvae of this species feed on microscopic organisms. They eat tadpoles and some aquatic invertebrates once they are a little grown. The lifespan of this creature is 12- 15 years. 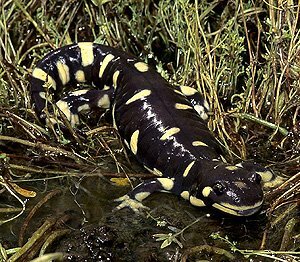 The predators of California Tiger Salamander include American Bullfrogs, California Red-legged Frogs, Skunks, Garter snakes and Ground Squirrels. Both terrestrial lands and small pools of water are necessary for these salamanders to survive. The tail of this creature is toxic. It may even cause death if ingested by any chance. These creatures were formerly considered to be a sub-species of the Tiger Salamander species. They were given the designation of a separate species in a recent past. They spend most of their lives under ground. Some people refer to this habit as aestivation. But true aestivation has never been observed. The larvae grow lungs as the ponds they reside in dry out. It is then that they move on to land areas to become terrestrial beings. The members of this species are protected by the California State and Federal laws. The main population of this species is given the ‘threatened’ conservation status. Many communities have gone extinct due to the lack of suitable habitation area. Becoming the prey of non-native predators like bullfrogs is also a problem. 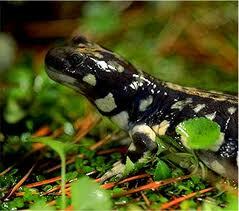 The California Tiger Salamander populations of Sonoma and Santa Barbara are already listed as ‘endangered’. Recovery plans to save this species are under development. 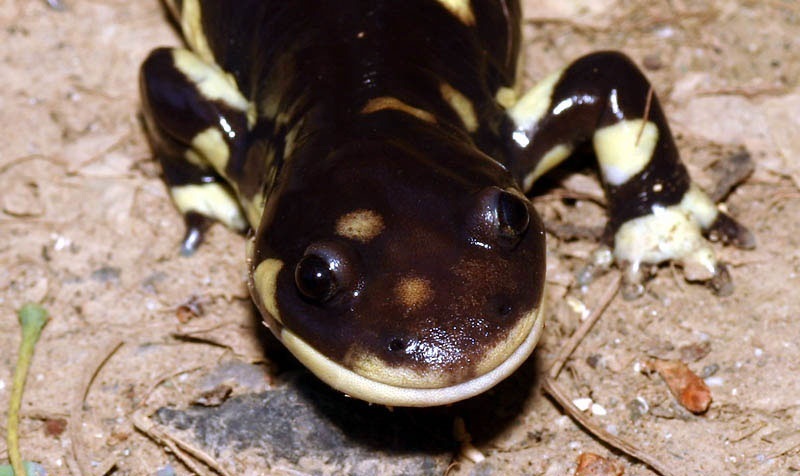 The Santa Rosa Conservation Strategy for the recovery of the California Tiger Salamander is completed. But it has not yet been put into action. The California Tiger Salamanders are an amazing species. But they are on their way to extinction. Still, people are trying to do whatever they can to stop them from disappearing. In the past few years, these creatures have become quite a popular choice for a pet. They make good pets. Let us hope we can save these creatures from facing extinction. Do you want to know how these creatures look like? Here are some photos of the California Tiger Salamander. Check out how wonderful their color is and how good they look. I used to see a lot of these in very isolated spring pools at the Lang Ranch area in Thousand Oaks in the 80’s and 90s, near where the Chumash Center is now. There are homes there now and I don’t know if they still exist there due to development.